Ryan McIlvain was born in Utah and raised in Massachusetts. His fiction and nonfiction have appeared in many journals, including The Paris Review. A graduate of the Rutgers MFA Program and a recipient of the Stegner Fellowship at Stanford, he currently lives with his wife in Los Angeles. 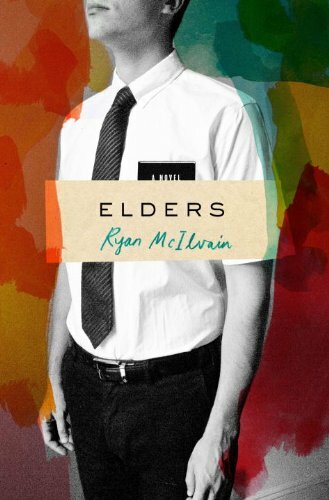 As part of Mormon Stories Book Club, today Heather Olson Beal and I discuss Ryan’s book “Elders,” which is the story of two young Mormon missionaries in Brazil and their tense, peculiar friendship. Elder McLeod—outspoken, surly, a brash American—is nearing the end of his mission. For nearly two years he has spent his days studying the Bible and the Book of Mormon, knocking on doors, teaching missionary lessons—“experimenting on the word.” His new partner is Elder Passos, a devout, ambitious Brazilian who found salvation and solace in the church after his mother’s early death. The two men are at first suspicious of each other, and their work together is frustrating, fruitless. That changes when a beautiful woman and her husband offer the missionaries a chance to be heard, to put all of their practice to good use, to test the mettle of their faith. But before they can bring the couple to baptism, they must confront their own long-held beliefs and doubts, and the simmering tensions at the heart of their friendship. Please support Ryan and Mormon Stories by purchasing the book through this link. John knew missionaries who regularly went to the movies? who left the country? had pool parties? …say what? How come I was dismissed for seeing a movie; after my companion refused to get up from his ‘siesta’ I went alone to see our 3:30pm appointment -then came back to find my comp gone, so I went to see a movie a block away from the pension but was dismissed from the mission because of it -why weren’t those missionaries from John’s mission dismissed to? How unfair can the church get? and still today people think I did something terribly wrong in the mission or am some sort of coward for not completing the full 2 years….so much for mormon justice! I’m guessing you were dimissed not for seeing a movie, but not staying with your companion when he was sleeping. This podcast really hit home for me. I actually made a TV pilot with similar themes to the book Elders, but mine is more comedic in nature, and takes place stateside.